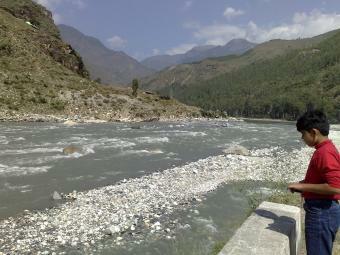 This byte is a continuation of my road trip from Narkanda, which you can read here. After a relaxing night at Narkanda, we set off early the next day for Sangla, which is in Kinnaur district of Himachal Pradesh. 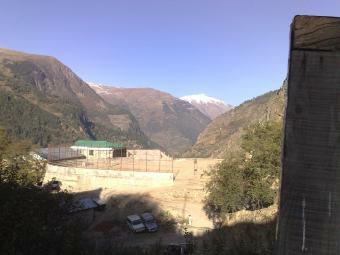 It is about 170Km from Narkanda via Rampur. This stretch of the road was very good till Rampur and so we made good progress as even traffic is very less this side of Hiimachal Pradesh. 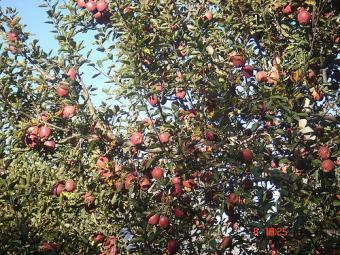 We saw plenty of apple orchards all along the mountains on this route, although most of the trees were now bare of fruits as they had finished harvesting at this time of the year. This part of Himachal Pradesh has not yet been bombarded with modern facilities and hotels and so we got to see the original beauty of the place along with their culture and their simple way of life. For, Himachali folk are very simple down to earth people and also very polite, warm and helpful in general. Our petrol tank was now nearing the "half" mark and so we started hunting for petrol outlets in every small town that we passed and found that there was no petrol in most of them. Let me add here that there were not that many small towns in between either. They were spread far apart from each other. We passed about two to three such small towns each one promising us petrol in the next one. Finally, we reached a town that had some petrol and we managed to get petrol for Rs 200. They told us to go ahead to Rampur where we would get more petrol. On the way downhill to Rampur, we saw the Sutlej river and we had to drive alongside it for most of the distance uptill a place called Karcham where the Baspa river conjoins it. 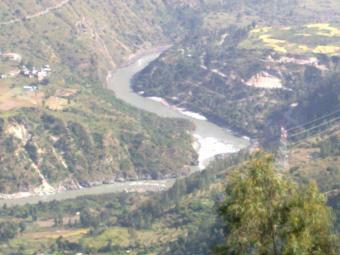 See Picture of the Sutlej River from the top and bottom of the mountain. We also saw a Hanuman Temple at the roadside on the way. 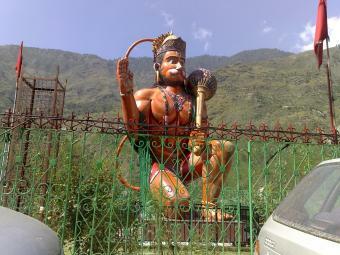 Here is a picture of the huge idol of Lord Hanuman. We reached Rampur and managed to get petrol on the way and filled our tank. That was fortunate because we realized that after Rampur there were no more petrol outlets all the way to Sangla and back. To add to it, the other facilities, like hotels and roadside Dhabas also thinned out and as it was nearing lunch time we started looking out for a decent place where we could stop for a meal, but found nothing till a place called Wangtu. Let me also point out that the road from Rampur onwards became bad again which slowed down our speed quite a bit. There is a lot of construction work of a hydroelectric power project going on on the way and so there is no proper road for a long way. To add to this, there were the landslides which had happened recently during the rains which narrowed the road even further at some points making it very dangerous and risky. At a place called Wangtu, we finally found a very good Dhaba which was serving hot meals for only Rs 25 a plate with unlimited quantity. We enjoyed hot rice, chappatis with dal, Kadi (a local Himachali dish made from curd) and some vegetables. It was very delicious and tasted like homemade food. The service too was excellent. 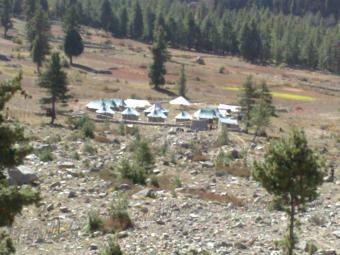 You won't find any other place to eat after this point till Sangla. 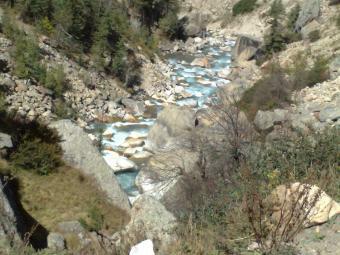 The road from this point vanished altogether and became even more tricky and nerve racking all the way till Sangla. We managed to reach Sangla Valley which is situated at an altitude of 8,900 ft, after 2 hours of driving, although the distance left was not all that much. We arrived just before sunset and started looking for a place to stay. We found to our dismay that all the hotels and rooms had been booked in advance. However, after searching here and there, we finally managed to get a room, a dormitory with four beds, at one hotel, and having no other choice, we grabbed the room and settled in for the night. That day there were clouds in the sky that were threatening to rain. We even had some thunder and so it became quite cold and chilly. Here we finally saw the snow covered mountains towering right in front and over us. It was a magnificent view. However, since light had faded and night was falling, we retired to our room and crashed in bed after a hearty dinner of dal, rice, vegetable and rotis that was cooked graciously by the hotel cook. 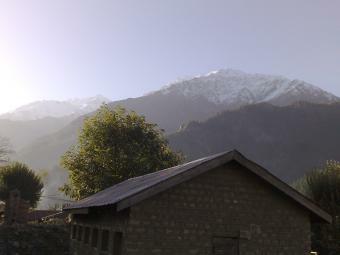 The next day morning we set off to see the Sangla Valley and to Chitkul. 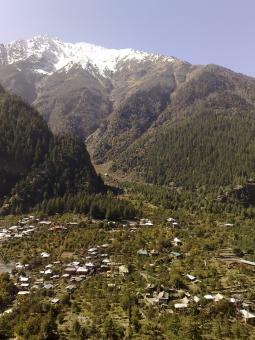 The Sangla Valley is spread all along the Baspa River with the snow covered Himalayan mountain ranges all around it. The beauty of the valley is absolutely breathtaking and awesome. There are small towns that are nestled in the valley and look so peaceful and serene. This was real unspoilt beauty at its best. That was the end of this part of our trip. 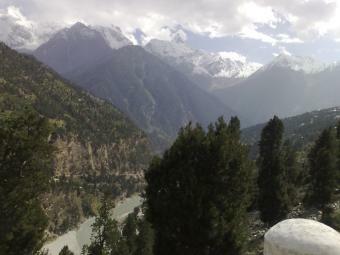 We reached Chitkul and then turned back to proceed to Kalpa the same day. But that is yet another story.